Shield: Gules, a double-headed war axe or, issuing from base. On a chief arched argent a mullet of seven points pierced between two mullets pierced, all of the first. Description: The red is for Artillery. The double-headed war axe signifies the dual mission of the battalion as anti-aircraft artillery and as ground support for armor. 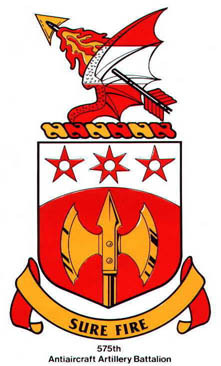 The arched chief alludes to the sky and the three red pierced stars on the white chief, suggesting shell bursts, stand for the units action in the Ardennes, Rhineland, and Central Europe Campaigns. The number of points on the stars, 5,7,5, indicate the numerical designation of the battalion.